Your ability to convert prospects into paying customers is greatly influenced by how comfortable new customers are when they visit your place of business. A bright, clean, open and uncluttered look is strongly associated with professionalism and quality. To maintain an environment that encourages good business, you need the trustworthy commercial building cleaning services from Valor Janitorial. 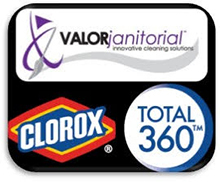 Valor Janitorial is an experienced provider of office cleaning and janitorial services in Dallas-Fort Worth. We specialize in delivering prompt and effective office cleaning to a wide range of business types. Whatever your niche may be, our up-to-date knowledge and state of the art equipment will enable us to serve you exactly how you want us to. We take pride in our ability to tidy up your facility with minimal business disruption while keeping its contents secure when we’re at it. We provide the most advanced and state-of-the-art commercial cleaning services in North Texas. Please call our friendly and knowledgeable staff for a free estimates. Or if you like contact us with any of our easy to use website contact forms. For the very best office cleaning service for the most affordable price in North Texas, count on Valor Janitorial to do it all for you!